We welcome our guests at Failaka restaurant for Iftar and Ghabka this holy month of Ramadan. Enjoy our chef’s finest and traditional Arabic cuisines combined with International delicacies to suit everyone’s taste. Be mesmerized by our lantern displays at the staircase complimenting the elegant majlis at the entrance of the Failaka restaurant. A mixture of traditional and contemporary décor that are surely appealing to every person’s eyes. Failaka restaurant is set with an elegant atmosphere, lined up salads, hot mezzes, main dishes, an array of Arabic Sweets, Ramadan juices and so much more! 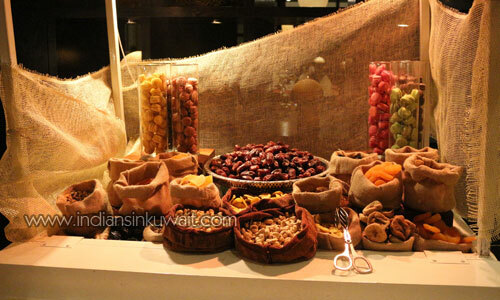 A beautiful display of dates and dried fruits is all set for the guests to break their fasts.